It’s Halloween again! Gather ’round the fire, kids! Time for some deliciously dark and scary stories! 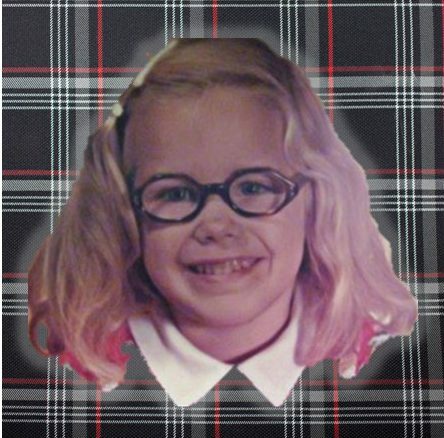 Once upon a dreary time, I was your age and living through the ghastly 1970s and 80s. (lightning flashes) Times were hard during this digital-free era; my daily life was a constant battle between the forces of good and evil. So many things went bump in the night. How I survived without today’s technology is a mystery. When I was 12, if I wanted to call up a friend, I had to wait for my stupid brother to get off the phone. That’s right. We had only one line. Countless hours were spent seething with anger and glaring at the phone cord trailing underneath the closed closet door where my older brother whispered sweet nothings (emphasis on the nothings) into his girlfriend-of-the-month’s ears. Then I’d endure hearing the telltale click of one of my brothers picking up the phone on the other line, quietly breathing and listening to my heated private conversation about how I liked Bobby, but Bobby liked Suzy. The terror of realizing my brother might have heard something super secret would paralyze me with fear. Did he hear what I said? Is he going to blab it to the cool kids at the lunch table tomorrow? Will Bobby know I like him?! The phone’s ominous click would seep into my dreams. Click! CLICK! CLICK! Oh, the horror! I was the proud owner of a giant boxy beast of a stereo. It was versatile, top-of-the-line technology for the 80s. I could either slap a record on the turntable up top or slide in one of my famous mixed cassette tapes of the Beatles/Def Leppard into the deck on the bottom. See, back then we didn’t have iPods where you could casually flip through thousands of tunes using your magic fingertips. Instead, I had to sift through a dusty old stack of albums, then listen to my favorite song skip on the needle. Hearing John Lennon sing, “Imagine there’s no–Imagine there’s no–” over and over again was horrifying, my blood would run cold. Imagine there’s no what?! I’d cry. No what, John?! Will I ever know what he’s trying to imagine? Today, I miss listening to music and forcing everyone else within a 10 mile radius to listen to it too. Sometimes for fun, we’d crank up the volume so loud, the neighbors down the road would call the cops. You can’t pay for that entertainment, people. Yes, before netflix, before DVDs on Blu-Ray, there was a time when we had to physically go to a place where people stood around like zombies, milling around displays filled with these things called VHS tapes. Inevitably, you’d arrive all excited to rent the latest hottest flick that finally came out on video after being released five years earlier (“Hot damn! I’m gonna go rent ET tonight!”) only to find that the 55 copies of ET were already taken. Are the Spaghettio’s done yet? No, but my skull feels like it’s melting. So I’d slunk on back to my house, “ET”-less, stomach growling and attempt to whip up some food. Did I zap some frozen meal in my microwave? Please! Only one friend of mine had one of those new-fangled contraptions. It was bigger than the entire kitchen counter and made such a loud buzzing noise we thought for sure we were getting cancer while watching her spaghettio’s splatter. 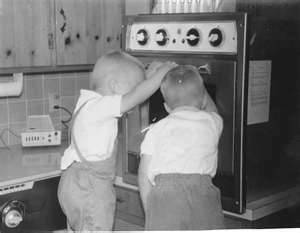 But only if you held a metal spoon just so and turned the loose stove’s dial at the same time. It was quite the science experiment. My brothers discovered this zapping action by accident one afternoon while making spaghettio’s and that was all it took. More cheap entertainment. “Hey! Check this out!” one of them would yell, stabbing the metal spoon down into the pan, feeling the tiny yet delicious jolt over and over again until they saw stars. Explains a lot. That’s right. Sweat a lot. My bedroom was upstairs in the attic and it sometimes got so hot up there in the summer, my John Lennon record would melt into a sad Imagine puddle. So I’d whine and moan and cry to my parents. “It’s too hot! I can’t sleep!” And my father would put his hand on my head and say, “Tough cookies, kid”. What a wise man he was for giving me an extra dose of the tough love of the 1970s. So kids, as you drift off to sleep tonight, watching the latest flick on your iPad, texting away on your smart phone and eating your Hot Pockets in your perfectly temp-controlled bedroom, think of me and the horrors I faced not so long ago. Nighty night, kiddies! Ha! Oh yea, I used to sleep in front of the one fan in the hall that was to cool off the whole upstairs (Dunn Dunn)! Great post, thanks for the laugh! Joy, I remember after complaining so much, my dad dragged this gigantic industrial-strength box fan upstairs and plugged it in the attic next to my room. When he turned it on, the wind was so powerful, it blew all of my Shaun Cassidy poster off the walls. And it only made it hotter, if that were possible. great post, wonderful memories! thanks for sharing. LOL! Loved this post. Of course, I would love real ghost stories too, but this brings back so many memories of a childhood that is very different from today. I look forward to it. I know what you mean about cassette tapes. I know that somewhere floating around my parents house are some cassettes with our attempts at making radio shows. Shudder. We did the same thing, Lisa. I bet one of my brothers has all of those embarrasing tapes hidden somewhere, ready to bust them out and humilitate me in front of the kids. I still have one cassette tape of me at around 11 years old, talking about the new group Def Leppard with my best friend at the time. memories…! Love it! Although, I do remember waiting in lines that stretched around the movie theater, to see the hotest new release- pre-video rental stores. And the theater in Maine only had one projector, so there was an intermission between reels. I also remember lying in bed on those stinking hot and humid nights with a wet washcloth that I would move from my face to arms to legs and back until I finally fell asleep. Should I feel badly that I still have most of my records that I had when I was in highschool (and a few from childhood, like the Banana Splits)? And boxes of cassette tapes? Great music! Sue, even in college I remember going to the only theater in town, it was in an old barn, I kid you not, and only had one projector. If you didn’t want to see the flick they chose for that month, too freaking bad! ha! I think most of those hot nights I ended up sleeping on the front porch in my grandmother’s old wicker chair. Those were the days! The only theatre in town in an old barn?! Ha! Yes, well, times were pretty naive back then. We felt safer. Just what are you insinuating, Peg? How’s Mr. Skittles doing, by the way? Did you find out he needs to wear a diaper yet? By the way, Peg. This morning I left you a note on your blog about not being FP as much as you and suddenly, I’m FP. Coincidence? Hey, I just noticed! Congratulations – that’s so great! Whoo hoo! Tell someone in your family to feed you sometimes as you toil away in front of your computer, taking care of comments. Mr. Skittles will just go right back to you when you are FP again next week. He’s so predictable. Oooh, very spooky indeed! Although secretly, I am thinking you had it better growing up 🙂 I think your Dad sounded like a wise person. Hey, you made it to Freshly Pressed! Woo Hoo! I loved this post by the way, awesome! Awe well the times have changed and now we must compensate for it. Yes, many kids have it easier nowadays. You should read Mass Media Revolution. It is a textbook, but more like a coffee table book, in my opinion. Fun and very new! Times have changed drastically. To put it in perspective when I was growing up, all I had to do was talk to my Gram a bit. She was born in 1901. When she was a child, only two people in town had a car and she always told me the story of when they hit each other. Or how she got a scar on her leg from riding in her father’s horse and buggy. I think she earned the right to say she had a hard and unspoiled childhood. Ha! Oh thems were the day…AND FRESHLY PRESSED TOO!!! Can you imagine? Not knowing who was calling, nowadays? I remember picking up the phone the exact same second my best friend down the road would pick up her phone and it would be just like magic as the line was connected. I also remember my Gram’s phone number had only four digits. On more than one occasion, I too would pick up the phone to call my BF and she’d be there. Too funny! Wasn’t that just the creepiest when that would happen, Sue? It happened a lot come to think of it. Somewhere around my fifth year of college, my sister and I shared a house* with one of our ginormous martial art practitioner friends. Said friend was in a long-distance relationship with a gal he’d met from an online game, so that the only ways he could stay in touch with her was (a) to use the phone line to dial-up his ISP or (b) call her. He’d do these things for hours each day, so that when we needed the phone, my sister and I would rock-paper-scissors to determine which of us would have the unpleasant task of knocking his door and letting him know we needed to use the phone for a moment. Those were some scary moments. He looked a lot like Vigo from Ghostbusters 2, actually. Now this friend is a SAHD of two kids. Occasionally I’ll watch him playing with his little ones and laugh at the contrast between the him of today and the one that once was. Mostly, I wish I’d had a videocamera so I could share the videos with his kids when they get a little older.
. . . if, of course, they were even playable on newfangled devices by then! * Unlike Los Angeles, college students could actually do that in Eugene. Not an apartment. Not a quad. Not a room. A house. Vigo from ghostbusters! Creeepy, Deb. I just realized I actually already have a picture of him on my blog! With his permission, I posted this image of “Pieter Ponyking” in my blogging awards post a few months back. Did we ever. A/C was what the rich folks had. I still feel like spoiled aristocracy livibg in an apartment with climate control. And a combo washer/dryer with a DELAY setting?! Holy crap, I’m in the Jetsons! My husband still has guilt even putting our little a/c unit in the window. I usually end up begging him to turn it on once August hits. Otherwise it’s the oscillating fan. We’re spoiled. Speaking of laundry, my mom used to actually hang our clothes out to dry. yes, crazy! we had no dryer so out came the big basket of clothespins. She’d have us kids hang them up and take them down. Loved to see my underwear hanging out for the entire world to see. Hey Maineiac, congrats on being Freshly Pressed! Angie, movies would take so long to be released on tapes that we often went to the theater several times to see it (tickets were dirt cheap then) because we knew by the time it was on VHS, the world would have ended. (I meant to write “past-o-phile”…gag, my Latin.) Just wanted to add that I saw ET, Fox and the Hound, and Annie twice each in the theater for the exact reason you stated. And forget about any Disney movies being released on tape back then. Never-ever. That’s why theaters were able to re-release them a gazillion years after they were made. What a beautiful inter-generational thing that my mom and I both saw the same Disney cartoons in the theater as children. That is a great memory to share with your mom. I have a vivid memory of seeing ET in the theater and crying (oh, my brothers teased me for that one!) I also remember seeing Star Wars for the first time at the theater. Movies were a special event back then, weren’t they? We’ve come a long way, Mags. My kids have no idea. What I love is seeing the reactions of kids now to our childhood technology – my son laughed til he cried when he saw atari “pong”. And an “old” movie showed a computer screen before Windows – he could not grasp the idea that computers existed separately of windows & the internet. (It was not easy back in the jurasic period!) Fabulous blog. Oh yeah, pong! Even the early Atari games, like Frogger, my kids would just die at the graphics. And I forgot to mention the computers. We had one of the earliest Mac computers. It took several days and miles of entered code to create a line or a triangle on the screen. But oh was that triangle something to behold! CONGRATS ON FRESH PRESSED! WOO—HOOOOOO!! Thanks! 😀 Good to see you again! We were lucky to have those things I mentioned even of course. We also had days where all we had was our imagination. Sigh. 🙂 That was a good thing. “Still, you’d desperately try to bring an empty box up to the counter,” YES! My sister and I did that all the time. I thought we were the only ones. Hilarious! I was totally drawn in to your horror stories, and can (shiver) remember those times. 🙂 Well done! Congratulations on being Freshly Pressed! It’s well-deserved! thanks! Oh, thank God you know what I’m talking about with the empty boxes. I think I did that for years and never caught on. Yes, no call waiting! It was just terrible back then. I remember when we finally did get call waiting, it was like the heaven’s had parted. Of course, my brothers would just ignore it and continue their marathon chats with their girlfriends. The thing about one line is, my dad kept putting phones in every room, thinking that would somehow help. I remember when call waiting first came on and you had to go answer that call you just had to, and the person you were orginally talking to would wait and listen to the crappy hold music because it was a novelty (as long as you didn’t cut them off). These days I get call waiting beeps and unless I am wanting to end the convo I am having I just say, “if it is important they will call back”. Ha ha, great post. Reminds me of trying to fizz up cola even more using a soda stream and trying to put a Betamax tape into a VHS player. Good times. Sounds dangerous, Dazzle. Those days were full of good times. Congrats on being Freshly Pressed, D! Great post. Are we becoming our parents with all this “when I was your age” stuff? I think we all promise ourselves as kids that we’ll never say that to our own future children, then we all end up doing it anyway. 😛 So much of this rings true with me. I appreciate advances in technology and home climate control, but I’m not interested in raising entitled d-bags. Hahaha!! Brilliant post! My favourite line: “Yes, we used to have to listen to our music out loud!” Hilarious!! Thanks, PCC. The other night, I thought it was so strange how I was on my iPod, my son was on his iPod, my daughter was watching a movie with earbuds–it was so quiet. Not like the place I grew up. My brother would be blasting Led Zep in one room, me The Beatles in another. My poor parents! We had what I think was the last VHS player ever made, until my son did the same thing to it a few years ago. Haha! That’s so funny! I wonder how many players died the PBJ death? This post is great! 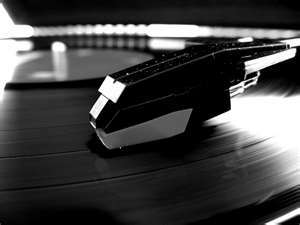 Yes, I used to blast my stereo too – playing an LP at different speeds was always fun. Good thing they didn’t have ear buds back then or I’d already be deaf! If it makes you feel better, I still don’t have an air conditioner in my very old, falling apart house. I have step-siblings who are 10+ years younger than me. It’s pretty crazy how different are childhoods were. We have one tiny a/c and I do like to have it on sometimes, while my husband would be fine roasting with a little fan. I looooove this post! Haha. I remember when I had to get off the internet when my dad had to make a phone call because we had…DIAL UP! That totally blew. ditchthebun, the sound of the internet dial-up still haunts me today. Wow.. love this post! I can relate to all of it… 🙂 Thank you so much for sharing your memories.. I wonder what kids today would so if they had to … *gasp* wait to use the phone! Aiiieee!!!! I think their heads would implode. If they had to wait for anything, their heads would implode. Nobody practices patience anymore. I’m glad you enjoyed the spooky memories and you can laugh about them now. I know I can. Hilarious! I remember most of those contraptions except records and no microwaves?! I would just DIE! Other people had microwaves, just not us. My father wasn’t hip to the latest “fad” technology until we complained enough. We also didn’t have a shower. All we had was a big old claw-footed tub and a cup. That was our shower until I was in high school. Love this! It’s funny, and dare I say scary, to think that we were used to such things not that long ago. Sometimes I’m not sure what I’d prefer now, it was nice to be able to have things a bit more simple and less technologically complex. It wasn’t that long ago, that’s what’s scary. Where the hell will we be in five years? Congrats Maineiac! Freshly Pressed.. hubba hubba. Loved the post. You sound more like my little brothers age. I grew up with the first b/w RCA ever made and it still sits in my parent’s house. Thanks, kibble! We had a little black and white TV upstairs in my brother’s room and we used to fight over it. Life was so horrible back then. And yet we all survived. Congrats on being Pressed! I wonder what our kids will tell our grandkids? Thanks, Rumbley! And, we actually had to get up off the couch to change the channel. Seriously, how did we ever survive? Fantastic post! I was going to mention not having remotes and a few other things, but then my list would have been way too long! 😉 ha! Thanks youngamerican! Yes, and how about 8 track music tapes that we thought were so cool and so techno! I agree: a remoteless house would be a disaster. Might as well catch a stage coach to the next town, and hope the pony express has some mail for you! Well I remember 8 tracks. We had Cheech and Chong’s comedy routine on an 8 track tape. I remember how frustrating it was if you wanted to listen to a specific track and had to skip all over the place and listen to it all over again. Dial up internet. I remember finally getting a second line just for the dial up so phone calls wouldn’t interrupt whoever was on the computer at the time. That really doesn’t seem like very long ago at all. I enjoyed your post! Scary indeed. Ha! imaginecreation, exactly. CD players were so revolutionary at the time. It was like magic being able to skip to the track you wanted in a second after dealing with cassettes for so long. Thanks for your comments. I’m happy you enjoyed it, Shane. Wow! Quite a horror story! Made me feel really thankful for all the little-big conveniences that we so take for granted! Wish I could show your post to all those people who keep their A/C temperature super-cold and then stay swaddled in thick quilts all around the year instead of just using the fan when it’s cooler! Of course, they would just laugh it off. P.S. Wish I could get someone to repair my dad’s first professional camera so I can use it to kickstart my own career. Unfortunately, no one deals in film cameras anymore! Thanks, Adee. We definitely had it hard back in the a/c-free days didn’t we? Of course, now if the power goes out, it’s like the end of the world for my kids. Thanks for visiting my blog. Oh, the analog days 🙂 I’m of the generation that straddled analog and digital while coming of age. And to think my youngest child is four so she’ll never know any of these horror stories. Too funny, Darla. You’ve shared the stuff of nightmares. Thanks. I’ll be sleeping with my ‘green’ fluorescent light on all night long. Ha, Lenore! Our VCR player was huge and ugly and took up the entire top of our giant ugly TV with the wooden frame. I do remember renting video game consoles like the first Nintendo at the store. We had it sooooo bad back then…sigh…. I’m scared! I might not be able to sleep tonight! My job here is done, Rai. I really really enjoyed this post! It made me smile, laugh and realize again how quickly we get used to technology. And to think that I actually did know a time without internet, ipods, blogs and facebook…whereas my younger brother (10 years younger) has NO clue what that’s like! Thanks for sharing and congrats on being, very deservingly, freshly pressed! Dounia, I would like to go back to the days before facebook in a way. I think I had too much time on my hands then. Thanks for your comments. very funny! and applicable. it’s crazy how much changes in just 10-20 years. i just hope that at some point in my life…around retirement…i’ll be able to set aside all the gadgets and gizmos and relax a little. step off the grid for a bit. thanks for sharing! I’m not even sure I’ll be off the grid when I’m old and gray. I hope so. When I was 13, I caught my Dad listening in on my conversation with my first boyfriend. (dunn, dunn) I was pissed, he was embarrassed (’cause there was nothing going on at the time–I was just barely a teen–nothing interesting happened until I turned 16) and I learned that any little click meant u know who was on the other line. I learned to speak in code after that. Kids today have it so easy. The click was so unnerving. And sometimes you weren’t sure if you were imagining it. Usually it was my brothers trying to listen to my conversation. Sometimes I could even hear them laugh on the other end. Ah the dreaded click. After all of these years, my heart still skips a beat. Four little words: Black and White Television…………….Lightning strikes. Yes, we had one, it was small and my brothers and I fought over it all the time. Oh, those memories from surviving the 1970s and 80s. Been there, done that. Glad I didn’t melt any John Lennon records, horror of horrors LOL. Congrats on the FP! You so deserve it, Darla! Ha! Your comment made me laugh. Those pauses and clicks kind of took the enjoyment out of music didn’t it? I suppose you don’t have to be as old as me to appreciate how hard times were a mere 10 years ago. Great post and congrats on the FP! Thank you for sharing your tale of horror, I feel better just knowing that someone else was there and remembers the dark days. I try to explain those horrors to my child, who can’t imagine how we lived through all those days of writing our papers for school by hand or if we had access to one and knew how to use it-the dreaded typewriter with those creepy metal tentacles. Yes, we lived through the horrors and can now share our cautionary tales least those giant cell phones rise up again and plan their comeback! Thank you for bringing up papers at school. The horror! I took typing in high school. If I told my kids what a typewriter was they’d look at me like I had three heads. I remember the ink on my fingers, the ribbon always getting jammed…Kids today have no idea. I remember it all, just as you wrote it. Remember before answering machines, too? I have to remind my HS students when we watch an older film that the technology was very different. Hi Tar-Buns! Glad you enjoyed the banter. Your sister is a complete HOOT as I’m sure you already know. 😀 I do find it very odd that I mentioned to Peg that I haven’t been FP as many times as her and mere minutes later, I am FP. 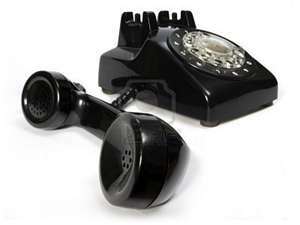 And yes, no answering machines or caller ID meant we had to answer the damn phone. Good god, how did we survive?! Haha great post. Makes me glad I live in the era of private phone conversations and of being able to hear what John Lennon imagines :). Thanks for the laugh! Yay, Freshly Pressed – congrats. We had an 8 home party line…it was bizarre. Love your spooky stories! Funny post! It made me laugh. Good job! You got FP. (DUNN, DUNN!) Congrats! (dunn, dunn!) is right! Scaaaary! Darla!!! Freshly Pressed!! And a new banner for the holidays!! Woot woot!!!! I love it! This was great. I can only imagine what people will say in another 10 years when I say I didn’t have a cell phone until I was 20. Scary. Dang Email, I just NOW got your post! (Groan.) I’ve seen 8-tracks mentioned – did you ever have a CB radio and listen to the truckers? (My folks’ house is fairly close to a freeway ) How about 78 rpm records? Those dopey walkie talkies that you couldn’t hear your friend on, even when standing right next to each other? My best was when I moved into a different bedroom, got my big speakers hung on the wall (which shared with the garage wall where the ladders hung), and first cranked up my Village People collection. (Yes, people, I loved DISCO – get over it! 😀 ) Not impressed enough, I linked in the 10-band graphic equaliser, and red-lined the bass. Blew my dad’s ladder off the wall. Had to move the speakers, swear NEVER to turn the volume up that high again, AND had to remount the ladder hangers myself. For a 3-story all extension ladder. Made of aluminum (no fiberglass back then, kiddies.) I was 12. John, your line “blew my dad’s ladder off the wall” just about killed me. Thanks again for the biggest laugh of my morning. We had friends that lived down the road, about five houses away. It was a contest between us to blast our stereos the loudest. They waited until their parents were gone, then cranked AC/DC so loud, we could actually hear it up the road. I remember walking down to their house, the sound so loud our ears started to bleed once we got within 300 feet. I think one of their speaker blew. God, those were the days! Oh god the CB radio! My dad was big on that…he’d click on it and say “Breaker 1-9, breaker 1-9, do you copy?” over and over and then start chatting with some random trucker going down the highway and discuss traffic delays. Cheap entertainment. I do remember 45’s. I remember those little plastic inserts that we had to put in the middle of the circle of the record so we could put it on the turntable. Good god, the humanity! Love it! I so liked your story even if I am European and don’t have Halloween stories to share, not at time anyway, but technology surging yes, only one phone line yes , only one phone going fro grey to white ( oh luxury !) in Paris.. and the boxy first Mac , I also knew a telex, does anybody know what that was…never mind great memories that you write so well and funny. Au revoir.. Thanks, Delizie. We had that first big ol’ Mac computer in the early 80s, my dad was so proud of it. It couldn’t do much at the time. God, I remember when the internet first came to our house in the early 90s. I had no clue what is was and thought it was pretty useless at the time. Way too cute! I so remember all those things!! Hey, remember the doll that would eat childrens hair and got recalled lmao!! No, unless you mean Chuckie? Whatever doll that was, good thing I didn’t have one. Although I did own a Cabbage Patch and that was a pretty scary looking doll overall. LOVE this post, it made me so nostalgic hehehe and it was kind of ironic for me as I had literally just finished presenting a class on the integration of web 2.0 technologies into libraries and catering for mobile devices. My parents moved into their first air-conditioned house when I was 2.5yo and I remember for years in summer I always thought my house was magical because it was warm in the winter and cool in the summer… ahh the imagination of babes. So much more fun than being an adult and knowing the facts! Oh I used to love going to the library! So quiet with the card catalogs and all. Miss those days. I am happy you enjoyed it, Louise. Three times the funny is a great compliment! Thanks! You had me laughing all the way through! Congrats on being FP’d. There is no greater compliment than knowing I made someone laugh. Thanks so much for the comment. At least you didn’t have to endure Betamax! I remember going to the video store and being disappointed. Then getting home and my brothers listening on the other phone. Those were the simple days! Thanks for bringing back some good memories! Aren’t brothers great? I had five, so I really don’t know how I survived them. Thanks for visiting my blog. It was frightenly normal, for sure. Thanks! What a great post! Very funny and so true! I am thrilled that so many of you bloggers can relate to the horror I faced. Shaun Cassidy! Lol! I was sure I was gonna marry him one day… While talking on the phone in the den closet. After listening to records and cassettes…. ohmygosh. My daughter is 14 and nearly died when she found out we could ONLY watch movies in the theater and the Christmas specials once a year on TV. Once. Can you imagine?!? Fabulous post – thanks for the trip down memory lane! Yes, the Christmas specials! Charlie Brown was something we looked forward to all year. And Saturday morning cartoons! My kids can sit down now and watch every single episode of iCarly on their iPod until the cows come home. They have no idea what it’s like to wait in anticipation of something special. Gosh, that brings back memories, though I didn’t have the phone problem you had. This is partly because I didn’t have any brothers or sisters to battle with, and partly because I am deaf…..so, hardly ever used the phone, and didn’t miss it! But I do miss those records, and reel to reel tape-recorders…loved to watch them turn round and round…. Well you certainly were spared the annoying brothers thing. I wish I had all of my old records. I think my mom sold them at a yard sale years ago. Oh and Happy Hallos…great page, thank you!! Me too. This is my favorite time of year, Halloween, Thanksgiving then my favorite, Christmas. Yes! We had to keep rewinding the tape over and over again. My favorite memory is when I used to try and record my fave song on the radio, then at the end the damn DJ would get on while the song was still playing and I was still recording and start blabbing. grrr! Loved this. You are so wise. Brilliant! Not what I was expecting – but entertaining none-the-less. I’m old enough to relate to everything you said! I am glad you like it, Transgressive! With the lack of entertainment back then, phones were a constant source of fun weren’t they? I suppose now it’s all texting. Just not the same. Great post! Love it. Congrats on being Freshly Pressed! I was born in the late 80’s and I don’t remember anything before 1994-95. All before that is a blur (I seem to vaguely remember a thing called MacGyver and Michael Jackson singing Bad). But even I remember a time when we had only one phone in the house and somebody always telling someone else to get off the phone! I remember cassettes and renting movies from video rental stores. We also had a big stereo system which I was forbidden to touch. So, I just listened to whatever my mom was listening to. Thus, I was ‘tragically’ acquainted with Don McLean, John Denver et al. and not with Radiohead or Oasis! That is pretty tragic. We used to have to listen to my mom’s stereo for awhile too. Oh the horror. When I finally got my own CD player for Christmas in the late 80s, it was the best day of my life. Nice. I love how America celebrates the season, not like Northern Ireland and the rest of Britain where I am. Anyway, I’ve done a couple of lists of 31 films for adults and 31 for kids to enjoy at Halloween. Some nostalgia, some unknowns perhaps. That turntable really took me back. I can’t remember the last time I saw one. I think my mother still has hers somewhere. Nothing like listening to a song, all scratchy and raw-sounding. Ahh, the olden days! I remember them all too well. Pogo sticks…Chopper bicycles…’Brown Girl In The Ring tra lalala’ and all that business. A good post, I enjoyed reading it, great fun. My father bought us a pogo stick for Christmas. He thought it was the best thing ever invented. I don’t think any of us actually used it even once. Congratulations on getting ‘Spookily Pressed’! 🙂 Happy Halloween!!! Thank you, Chris. Happy Halloween to you! You’re welcome. Thanks for reminding me that so many bloggers weren’t even alive then. Now that is scary. We often had to live with just a faint memory of our favorite movies back then. Now as soon as a movie comes out, it’s on Blu Ray. Oh man, this whole thing. I’m a young-‘un and I actually know what half of this stuff was like and nowadays is a pretty crazy time in comparison. Also, VIDEO TAPE RENTALS. OH MAN, REMEMBER VIDEO TAPES? I STILL HAVEN’T GOTTEN USED TO DVDs YET! And I wonder how long before DVDs are old relics? I am thoroughly fascinated reading this one! Cashier would reluctantly check and of course none had been returned. I also remember renting Nintendo games from the video store….good times. I would always ask if one was returned too. After the clerk would give me a good glare and say, no. I would ask him “Well, what about that stack of movies right there behind you? Could you look there?” and he’d have to restrain himself from reaching across the counter and punching me. But I did it anyway. I used to rent the nintendo games with my brothers all the time along with the console. We thought we had it so good then. I still have some VHS tapes. They do look kind of spooky in the loft!! Great post. My kids have a little collection of dusty tapes from some yard sale…Snow White movie, etc. They do look like spooky relics! Great post! I think everyone needs to feel the pain of having their favorite cassette tape unravel in the tape player. Then trying to wind it back up…fast forwarding and rewinding it to even the tape out with the hopes that it’ll play normally again. That and the brainpower it took to understand which button to hit to fast forward a song based on what side of the tape was in. Cause on my cassette player, I’d have to hit ‘rewind’ to fast forward the songs on side two of the tape. It was very counter-intuitive. Oh, cassettes! Thanks for bringing back the memories, and congrats on getting Freshly Pressed! Yes, I clearly remember struggling with the fast forward and rewind buttons on mine. Back then, we actually had to think a little when we wanted to listen to music. And my tapes were always becoming unraveled, then I’d desperately try to wind them back up to save them. Thanks for the comments. Interesting take on the ghost story! Although as someone who always tends to pay in cash, I am one of those rare young people who don’t perform transactions online and do them physically. Oh, I forgot; even as recently as the mid 80’s when I was in college, my boyfriend’s grandmother still had a party line (with the next door neighbor) for her phone. If he was visiting grandma and I called him there, I would always say hello to the old lady next door (who would always listen in on any call). I never could tell if she was on the line or not, but the first time I visited the little town in Vermont, I was walking down the street, a man I’d never seen in my life walked by and said, “You must be Steve’s girl.” Talk about small town! Now that is waaaay too tight-knit of a town. Talk about TMI. haha! This was great! I actually did laugh out loud! My kids don’t believe me when I tell them about the 30 foot telephone chord. We had a pretty short phone cord for some time (hence, why my brother hid in the downstairs closet) Finally, my parents bought a super long cord and to us that was like gold. We could drag the phone up the stairs and sit closer to our bedrooms to talk. I keep telling my kids about all this, but I’m just mom, so what do I know? A friend put together a CD for me, and I told my daughter he, “made me a mix tape”. She looked at me like I was out of my mind and said, “Mom, it’s a CD.” Ugh. Thanks for putting this together, it was great! Thanks, I’m glad you enjoyed the horror. Mixed tapes were the best and it’s kind of sad our kids will never have one. I can imagine when my kids are teens they’ll be in awe that we had simple little iPods. Technology is moving so fast now. You have quite the collection! We still have a VCR/DVD player in our house but I don’t think we’ve actually put a videotape in it. Back then movies were a special event. I remember going to the drive-in theater in my dad’s old station wagon. My brothers and I would put on our pajamas and get our sleeping bags and pillows. That was an experience most kids will never know. I also LOVE Halloween and seeing the cute kids run around in their costume always brings back memories. It’s crazy how technology’s changed many things…..anyways, congrats on being freshly-pressed! Thanks, Halloween is one of my favorite holidays. At least my kids still can know the joy or trick-or-treating if not turntables and VHS tapes. I covet your boom box. A turntable on top? State of the art! I remember all I wanted one year for Christmas was a “double box” with two cassette players so that I could make my own mix tapes. My first “walkman” was a knock-off that didn’t even have a rewind button. Those were the days! Oh yeah, my boom box was top of the line. I had it all, turntable and cassette deck! I was very lucky back then in a way. My brother had a double deck so we’d make our little mix tapes. I’m happy you and your sister could remember the good ol’ days. Thanks for your comments. I had a mix-tape for every occassion. Happy mix-tape. Party mix-tape. I’m in Love with So-and-So mix-tape. I Just Broke Up with So-and-So and I Vow to Cry FOREVER and Never Get Over Him mix-tape. We had to listen to the radio for HOURS to wait for the DJ to play our favorite song so we could record it on our tape players! The HORROR of actually having to be PATIENT!!! No instant gratification! How did we SURVIVE?! Great post. Brought back great memories. Hey, whaddya know! I had the same “I just broke up with so-and-so and I vow to cry forever and never get over him” mix tape. Classic stuff on there too…Bryan Adams, Pat Benetar…. There was nothing like the moment the DJ would play your favorite song was there? I bet I heard Bryan Adam’s Everything I Do no less than a thousand times the year Robin Hood came out. Remember the rush of excitement when you heard the first few chords of the song? Diving all the way across the room, index finger outstretched to hit the record button before the singing began? Those were the days. Scary is okay as long as you can laugh at it later, I always say. Congrats on a well-deserved FP! Funny post, but as one of those ‘ancients’ who grew up in the 50’s and 60’s, we old baby boomers experienced a more horrific upbringing than you guys! dunn, dunn. Party lines on the telephone! Which meant your neighbors could listen in on your conversations! The horrors! Movie night with the parents meant watching Dad’s home movies (soundless) from film on a movie reel on the old projector which sometimes stuck and made funny noises. dunn, dunn! Black and white TV! Listening to records (45’s and LP albums) on a record player (not even a stereo!) dunn, dunn! If we wanted to converse with a far-away friend, we had to get a piece of paper and a pen and write a letter, by hand!! And if we needed to turn in a research paper at school, we had to type it on a manual typewriter! No spell check. No instant editing. If you made a mistake, you either tried to erase it, which made a hole in your paper, or you started over again with a clean sheet of paper. Man, we had it rough, didn’t we? 😉 Thanks for reminding me of the good ol’ days! We had one of those old projectors. The only movie my parents had of me as a kid was an old silent one of me running in the yard chasing my brother on some dusty flickering reel. Which reminds me of when my dad finally got one of the very first video camera recorders in the 80s. He had to lug this giant VCR-like contraption over his shoulder, which was plugged into this giant heavy camera he had to prop up. He loved that thing though and recorded my high school graduation on it. Yep, hubby and I HAD one of those monstrous video cameras! That’s what we used to tape all our children’s escapades. And lugging it around and propping it up is probably why I have an out of sorts back and neck all these years later! 😉 White Out? I didn’t even have that new-fangled invention. Those were the days of using carbon paper to make copies. The other day I tried to explain mimeograph machines to a young’un (mid 20’s) because, back in the day, we didn’t have copiers. She just looked at me as though I were crazy and laughed her head off. To think copiers were cutting edge at one point! Carbon papers reminds me of some of my earliest jobs back in high school. We used to have to put down the carbon paper and slide the credit card across with this little machine then write in the amount by hand. Once I worked at a pharmacy where I used a little calculator and a pad of paper and pen to keep track of transactions! Apparently, this party line thing was a common occurence back then–and usually involved old ladies gossiping on the other end! I have to say I never had the joy of experiencing the that. I’m happy you had a good laugh and snort reading my post. These days I’m afraid to leave a fan out thats not attached to the ceiling..God forbid my children decides to want to touch the blades thats are only propelling at rapid speed. That or worse what if Jack Jack the fat cat gets a little too lazy and lax that his fuzzy tail falls victom to slaughter! Well maybe his tail couldn’t fit in the screen of the fan, but one never knows! LOL Great post! Fans were dangerous back then for kids and fat cats. Kids nowadays will never know what the relationship between a cassette tape and a pencil is. LOL! We lived with cutting edge techonology back then, didn’t we? Me too, Ciara. I love this time of year. I was born in the 80’s, grew up in the 90’s. I remember when my father bought this new stereo that could fast forward a track on a cassette tape. You just pressed fast forward or rewind and it would automatically stop at the next or previous track. And back then, I thought that was the greatest thing ever invented. In 9th grade Danny (the-cutest-guy-ever) actually asked me to meet him at the rollerskating rink (the-coolest-hangout-in-town). He held my hand during the couples skate…(romantic sigh) But alas, my joy was short lived (dunn dunn) when his buddies showed up and tried to convince me to join Danny out back to experiement with a different kind of “rolling the skate”. My Dad had insisted I take a dime in my pocket so I could call him “just in case” I wanted to come home early (much to my loud protest and rolling of eyes). I found the phone booth 3 blocks down the road and tearfully used my dime. Thankfully, Dad didn’t say a word when he pulled up in our yellow station wagon. He just quietly drove me home where I cried into my Luke Skywalker pillowcase. Ah yes, those were the days! Wow. You just described my entire childhood with that one paragraph. Except I had a Pac Man pillowcase. Thanks for the memories! Congratulations, my friend. It’s great to see you drowning in comments. Your writing gets better all the time. Thanks, Charles. This post was one of the ones where I sat down and wrote for no one else but me. I had a blast writing it, just let the words flow, never thinking it would be FP. Isn’t that always the way? (Wish I had edited it more) And I see you are drowning in comments now as well! Of course your post bumped mine off the top page, but I’ll let it slide this time around. 😉 Can’t think of a blog more deserving. I loved this, loved it! I grew up in NH, Lakes Region and we actually had to get up and go ACROSS the room (on our FEET!) and turn the knob on the tv to change channels! Oh, now, that was true horror! At least we only had the four channels to choose from back then. Wow, that brought back a lot of memories. The first VCR we got that was $1000. The first microwave we got that was $1000. Crazy! Now you can probably get a VCR for free, and even a DVD player for $25 new, and a microwave 10 times more powerful for $40. And gasoline is only $3.50 a gallon! Oh… wait a minute…. It all evens out in the end, I suppose. Thanks for the comments, Edward, they made me laugh! Thanks for visiting my blog, Myra. Oh that brings back memories. I remember when music tapes came out and you were able to record your favorite songs played on the radio …. on Sundays at lunch. It was the only way to have access to songs without buying the album or single for much more money than today. My parents very pretty annoyed. My parents were annoyed at most things my brothers and I did back then. We complained a lot but we had it pretty good. I grew up without videos and microwaves. We didn’t even have a toaster oven. My dad had a rule that we could only talk on the phone for 10 minutes and then had to hang up in case somebody was trying to call. We didn’t have call waiting in those days. If we talked on the phone too long, he would pick up the other line and tell us to hang up. We were allowed to call our friends back after waiting 5 minutes! Tell that to my teenager who texts, talks and skypes while watching TV and listening to music! I seem to remember my dad getting on the other line more than once telling us to get off the phone because he had to make a call. But your dad was much smarter by imposing a time limit. Congrats on being Freshly Pressed! We had only one phone, so that was a bonus. I remember having a party line with another household (don’t know who), but that was before the phone became my domain, so I didn’t have to worry about anyone hearing my secrets– except for my mom and the visiting neighbors or family gathered around the kitchen table. Thanks, Patti. I guess we were very lucky that we didn’t have a party line! I couldn’t imagine dealing with a party line in this day and age. Great post. I was definitely paranoid about my brother listening to my conversations on the other home phone. This brought back some great junior high memories, and that was only 10 years ago. It really is scary how much has changed in such a short amount of time. I’m thinking brothers everywhere must have taken some secret course on how to annoy their sisters! Thanks for visiting, Casallina. i used to hate the ’80s, especially the music. maybe it reminded me of the gazillion plants i had to water as a chore or how you have to crack open the VHS and clean them. But props on this horror perspective. i love the approach. Thanks, secondist. The 80s certainly had its fair share of cruddy music, I’m with you on that one. I’m a bit scared for my kids. My daughter know how to use our iTouch and she’s four years old. Technology is great, but it also delivers loads of information at super speeds…my kids are already too hyped up and have short attention spans. I try to limit their use of video games, computer because I think they just need to be kids and play more. Maybe even use their imagination a little, imagine that! Thanks for visiting my blog, Lost and Found. You may have been describing America in the 70s but that sounds more like my 90s Irish childhood! 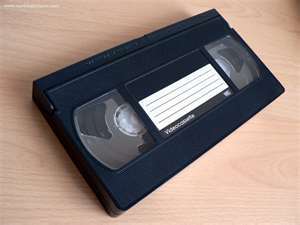 I only realised a few months back that my 9 year old brother had no idea what a videotape was. Scary stuff. Very true. The days of the video rental store were very recent. We still have a stack of VHS kicking around, but my kids don’t know what they are and have never watched them (our VCR is packed away somewhere too) I originally wrote this post as a direct letter to my kids so they could read it one day and be amazed (and scared). Thanks for stopping by my blog. Alright, the dance is over and I’m just showing up. 😦 Congrats on being freshly pressed – this was a fabulous post! That’s okay, I’m still doin’ the cabbage patch over here. Thank you, Mary. Awesome-I got ready for some scary tales and instead laughed my head off. I remember the days! I have no idea why FP put it down as “halloween”. Oh, that’s right, I tagged it as halloween. Oops! Glad you enjoyed it anyway. Thanks, Chris. I can’t promise anything, but I’ll try. I just checked out your site, very nice. Good thing most of it is only a memory. Thanks, domestic! Ha! I like your sense of humor! 🙂 Congrats on being freshly pressed! I am relieved someone gets my sense of humor. Thanks for your kind words, clearlyhomemade. Even as a 90s child, I can relate so very much! Funny funny, Lady. Even kids born in the 90s can relate. Isn’t that crazy? Thank you, Lauree. Thanks, it wasn’t so fantastic at the time. But I can laugh about it now (a little). Great post! Thank you for sharing! I will definitely follow your blog. Thanks, Oh God, My Wife Is German. I will be sure to check yours out. My husband is German, so that makes me…uh…not German at all. But I’m sure it counts somewhat that my last name is German and is always mispronounced? Thank you and I’m happy you enjoyed laughing about the past. Great post, reminds me of the time I had all my electronics confiscated *shudder*. I bet that was pretty traumatic. It would be for me! Now that is sad about your old cartoon tapes. I’m sure soon even DVDs will be a thing of the past at the rate we’re going. I miss listening to music out loud and ticking off the neighbors…sigh. can’t imagine how kids today live in our old age, it could be their real-horror..
My kids would be in shock if they lived in the early 80s. To think they’d have to wait until Saturday to watch their cartoons! Oh, the horror! Thanks for your comments, Sukmadityasari. A life devoid of immediacy and convenience! It gets no spookier than that!!! I’d love for you to add your “spooky” story and any others you’ve penned about Halloween, the paranormal or the spookiness of growing up at the Blog-O-Ween Blog-Hop! All the cool bloggers are doing it- and by that, I mean, Tori and Lisa Kramer have. haha! Hope to see you there! You’re my hero. I was just talking about how I would get SO upset when someone was using the phone because OMG I’m expecting a super important phone call! I always had to stand over the phone and let it ring at least 2 times before picking it up, too. Ashlee, kids these days, with their smart phones and instant access to facebook, texting…they have no clue what it was like to have to wait to make one phone call. It was a very scary place, fr3lancer.